If the market is generally increasing, stable or slowly decreasing (at a rate less than the average replacement rate for the capital equipment), new capacity must be installed, typically involving a modern, competitive technology, and any change in demand for the product will affect the decision on the size of this capacity adjustment. What technology is the modern technology may vary between markets. For example, new solid waste treatment capacity in Scandinavia will be 100% incineration, while landfills will still be part of the installed capacity mix in other parts of Europe. Technology descriptions in current engineering handbooks and the like will typically include a description of the modern technology. Differences in competitiveness of individual suppliers may be deduced from differences in the most important cost factors for the production, be it labour, energy or raw materials. Specific knowledge of the modern vs. old technologies should also be generally available in the investigated businesses, e.g. in the marketing departments. For some existing databases such as ecoinvent version 3, technologies have been marked as modern, current or old. 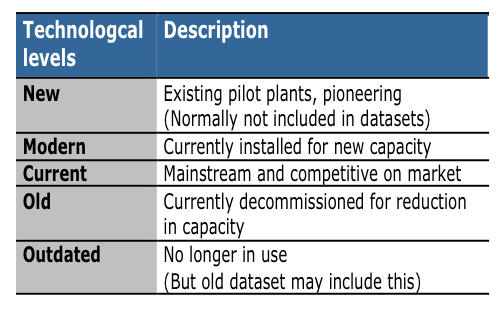 Table: Definitions of the terms used to characterise technologies. The marginal supply of vegetable oils An example on finding the marginal technology by looking for the most competitive technology on the vegetable oil market. Marginal copper production An example on identifying the marginal copper produktion. Marginal supply of steel An example about how to identify the marginal supply of steel. Heat recovery and system expansion An example on identifying the marginal capacity regulator for heat recovery. How to cite this: Consequential-LCA (2015). Increasing or slowly decreasing market. Last updated: 2015-10-27. www.consequential-lca.org.